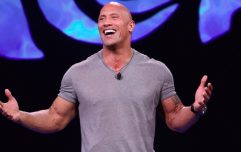 Most of us harbour visions of turning our homes into the ultimate personal workout space, and it's fair to say The Rock has fulfilled his dream. The former WWE Champion-turned-actor has recently been posting a high volume of footage from his portable gym, and it looks ridiculously well-equipped. Most commercial gyms aren't even kitted out as well as this, so here is a window into The Rock's space. In most homes, you can just about fit a pull-up bar. The Rock's place has a full pull-up station attached to a cable crossover, however. Most pull-up bars built for home use will just about take your bodyweight - but The Rock's will allow him to add weight to pull-ups too. The weighted pull-up is one of the best exercises for developing the back, biceps and forearms. Be careful you're not trying to pin your personal pull-up bar up onto plasterboard, as numerous gym fail videos unfortunately feature. This is a flywheel squat machine. The best gym in your city probably doesn't even have one. It allows the user to feel the force of a barbell squat without a barbell or any upper body load. If you've got lower back problems or are just looking to take your training up a notch, this machine can be useful for stimulating the quads, hamstrings and glutes. It has even been used in recent research. One study looked at the number of workouts you need to first notice muscle gains. Researchers found evidence of new growth after just five workouts on a target muscle group. The machine they used for this study was the flywheel squat. Who in the blue hell is going to argue with The Rock's leg day? The Rock's facility contains a specialist glute thrust machine. The People's Champ has been using this to recover from numerous injuries, following the advice of strength coach Dave Rienzi. The glute thrust is still a great exercise for building bigger and stronger glutes, even if you don't have injuries. When you sit down for long periods, such as with a desk job, your glutes tend to switch off and so activating them with this style of training is advised. Including a dip station in your home gym is trickier than a pull-up bar. Normally, the closest option involves using the tops of chairs, but that poses its own risks. Not only could you fall and injure yourself, but the chairs could break too. You want to have somewhere to sit to eat your Sunday lunch, remember. 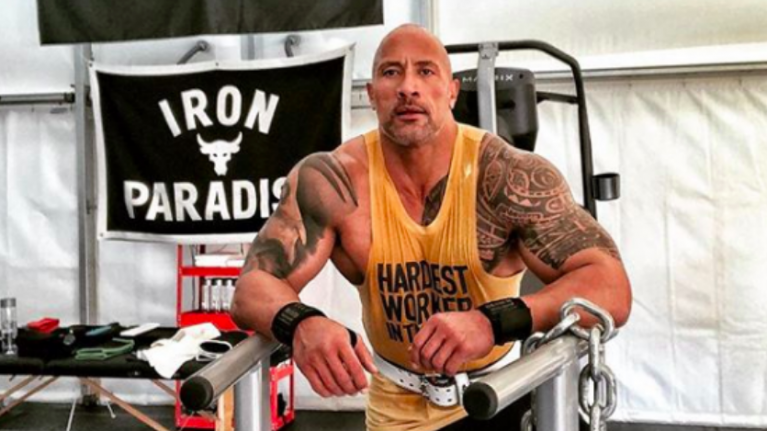 Only one other person has trained with The Rock in the portable gym - star of The US Office John Krasinski. Krasinski's comments were a ringing endorsement for the Iron Paradise. My good bud and the only human I’ve allowed in my traveling gym @johnkrasinski describes it..